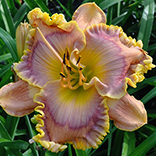 PUMPKIN PARK (Dan Trimmer) Tetraploid (Sdlg. X Sdlg.) 33" EM. Re. Ev. 6 3/4" (Sdlg. # 8-38) Oh, how I do like the hot colors in the garden. Easily seen from afar. 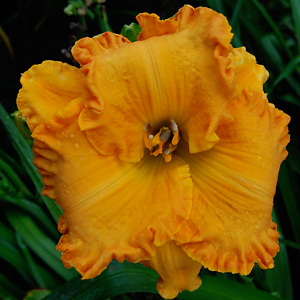 PUMPKIN PARK is a circular, ruffled glowing pumpkin orange self with three lateral branches, a terminal Y and 22 buds per scape.